autumn | Move your Assets! Put your carved jack-o’-lantern on your porch, but please pass along its seeds to your plate! Those tiny ovals will obtain an irresistible crunch upon roasting, meaning they have no place in the trashcan. 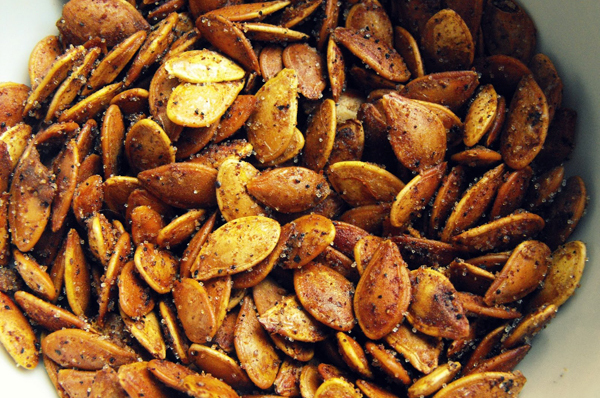 In addition to that magical magnesium, pumpkin seeds are packed with protein, fiber, and heart healthy fat. This all makes them an incredibly satisfying snack — especially when you add a little salt and curry powder to the mix. We’ve got the recipe below that shows you how to do just that, so get ready to go save your seeds and take them to the table. In a video-gone-viral, Michelle Obama says, “Turnip for what?” We’re responding to that question with this roundup of healthful turnip-central recipes. The late autumn crop is particularly low in calories among the root vegetable kingdom – just 34 cals per cup vs. 116 per cup of diced potatoes – and is packed with vitamin C and other antioxidants. This makes it a great filler and addition to lighten up traditional starchy dishes, like Turnip Mashed Potatoes (swap 1/2 the potatoes with turnips), and some of the recipes you’ll find below. Both the turnip’s greens and bulb can be eaten. Each provide a nice bitterness that pairs well with sweeter veggies, meats, and spices. See for yourself as you turnip some music and your stove, and dive into one of the recipes below. As summer officially comes to a close today, we’re bringing you a few pumpkin breakfast ideas to wakeup your autumn tastebuds. You’ll find all of the recipes below packed with both real pumpkin and oats, a favorite fall combination of ours. Both ingredients are filled with fiber, which means together, they’ll easily leave you feeling satisfied well into lunchtime. Studies show when you eat foods heavy on fiber, you can feel full on fewer calories. That’s clearly good for your waistline. Now, let’s make it good for your tastebuds, too, by creating a heavenly, pumpkin-pie-in-a-bowl meal. Although similarly spiced, you can guarantee the following recipes are all better for your health than a slice of pie, but perhaps even creamier and certainly easier to create, too. From a warm, to a chocolatey, to a make-ahead option, you pick your choice. 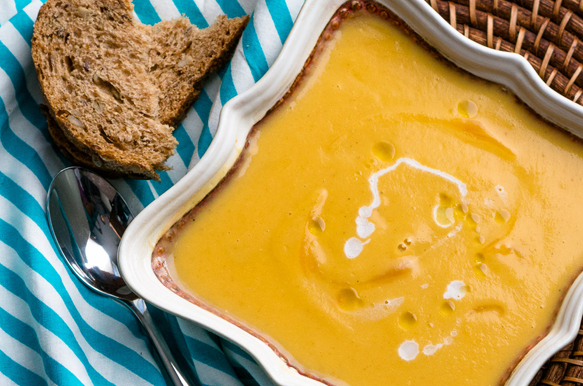 Then say hello to fall with a bright dose of orange on your spoon.